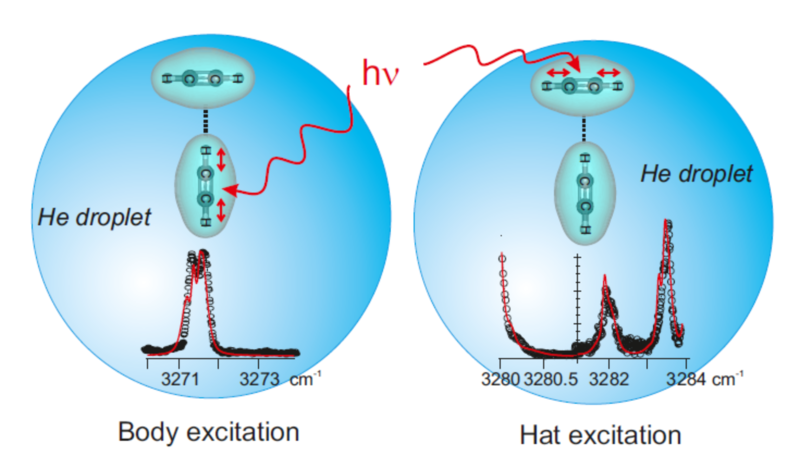 The CH antisymmetric stretch of the C2H2 moieties in acetylene dimers was explored over the range 3270-3290 cm-1 using the helium nanodroplet isolation (HENDI) technique. This work is part of a general investigation which addresses the dynamical consequences of coupling the deformation motions of weakly bound complexes with a finite size quantum liquid (the helium droplet). The acetylene dimer is attractive from this point of view because one of its deformation coordinates promotes a tunneling isomerization process. A numerical simulation of the observed spectrum allows deriving a set of effective spectroscopic constants which help understanding the dynamical role played by the droplet on the rotation and deformation of the dimer.